By 2020, a strong, democratic and united domestic and household workers global organization will be contributing to the protection and advancement of the rights of its 670,000 members, and the rights of domestic and household workers everywhere. In 2017-18, the IDWF workplan will help the organisation move towards achieving the five goals detailed below. The active participation of IDWF affiliates and continuous support from our partners will be vital in achieving these goals. 1) Federation Development – Increase membership to at least 670,000, in 80 affiliates, in 60 countries. 2) Strengthening Capacity Building – 950 domestic worker leaders will have the capacity to deliver trainings to 20,000 domestic workers. Convene at least three capacity building workshops for affiliates in East Africa and Middle East. To represent migrant domestic workers in regional dialogues and processes such as GFMD, Colombo Process, etc. 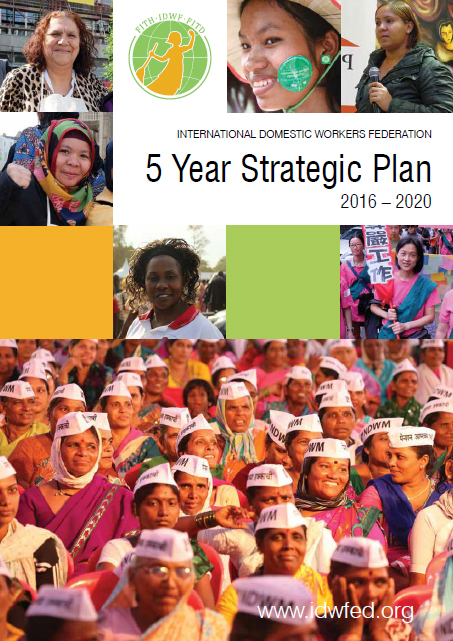 5) Representation of Domestic Workers – IDWF affiliates will have the needs of their membership represented at an international level through increasing representation in global trade union organisations, and strategic partnership with civil society organisations. To participate in the International Labour Conference in 2018.